I was at a funeral for an amazingly, complicated young lady today who sadly lost a battle at the age of 14! This photo was on the cover of the Order of Service, it was her favourite image because she always believed that in her dark and troubled times, she would sprout wings and soar. 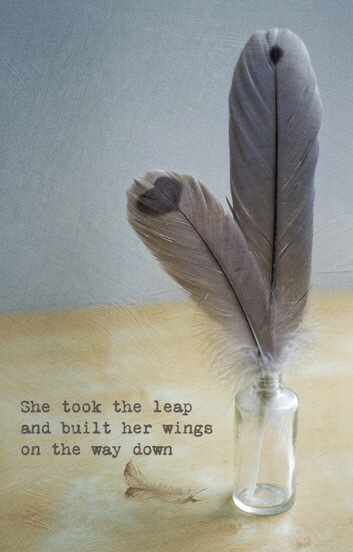 She would soar into the pages of books and never failed to find something to lift her! The final piece of music was by The Shapeshifters, Lola’s Theme! It was a favourite of both of ours. We would power walk to it and giggle at people looking at us because we both had iPods on and every so often would add a wee twirl or a shuffle to our step! If I learned anything from Sarah it was that no matter how far you think you are falling, somewhere out there you will find inspiration to fly again! Even in the blackest of times or in the darkest of moods there are words, actions or people that will provide the wings and the love to help you find faith, belief and live in yourself.